Sixteen finalists selected from 10 regional screening clinics held throughout the country this past spring and summer are currently taking part in the U.S. Hunter Jumper Association Emerging Athletes Program’s National Training session, Nov. 14-17, with clinician Peter Wylde at the University of Findlay (Ohio). Horses, all on loan to the EAP program, were assigned to the riders yesterday after which their flatwork was observed by Wylde, an Olympic gold medalist, and members of the EAP Task Force. Partnerships were still in the formative stage today, as more serious work got underway. 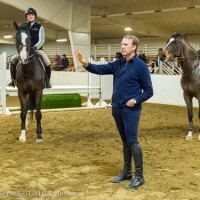 In addition to following the same general program during all four sessions of four riders each, Wylde spent time helping the finalists work through unique issues presented by various horses. His observations were sometimes funny (“jumps like a pancake”) and always astute. He was quick to praise riders as they adjusted their aids and were rewarded by improved performances from more responsive horses. Flat work began with walking out; Wylde emphasized the importance of ensuring that a horse isn’t asked to do work of an intensity beyond its level of fitness and that warming up at the beginning and cooling down at the end of a session shouldn’t be overlooked. Wylde emphasized as the riders began their flat work that the aim was to “train the horses to be polite, to wait and respond” to the riders’ aids. Riders were then asked to move off at a loose trot. After a minute or two, they changed direction, applying inside leg and rein to begin to soften the horse. Canter work included continued softening to the inside aids, then lengthening and collecting. “Be light when collecting; you don’t want to be too heavy with your seat. Doing that ‘splits’ your horse a little bit; you want to stay a little light on your seat,” he added. As riders prepared to jump, Wylde discussed stirrup length. “Longer stirrups are for when you ride the younger/less experienced green horse. You need your leg to be ‘around’ that horse, but for more experienced horses that jump higher, you shorten the stirrups,” said Wylde, adding that his own stirrup length may vary by as much as four holes. Work over jumps began with two riders at a time working on a circle over a cross rail, continuing with more circles, first over a vertical placed on an angle to the inside of the corner at the top of the long side, and then over a similarly placed oxer at the other end. A bounce of two crossrails was located equidistant between these and a short time later all four jumps were ridden together from either end. The oxer to bounce to vertical line rode first as a six-bounce-six, and then as a six-bounce-five. Riders then combined the above line with changes through the diagonals over either a square oxer with stonewall beneath it, or the opposite way over a liverpool. A four-stride line ridden both ways on the opposite long side from the bounce completed the setup; ridden together, all the jumps in the ring were combined in a 12-effort course. In addition to the riding sessions and caring for their horses under the supervision of barn manager Anne Thornbury, riders attended lectures or served as jump crew on a rotating basis, sat for a written exam and helped set the jumps in the ring for tomorrow’s course. Participating as EAP finalists are: Erin Bland, Katharine Carroll, Bowers Cone, Gabby Conte, Marissa Degner, Sunny Drescher, Jackie Flynn, Jesse Fortier, Izzy Gabriel, Sean Leckie, Connor Siegel, Emily Sowski, Megan Thomas, Lizzy Traband, Stephanie Whitworth, and Micheala Wood. Outnumbering the 16 EAP riders and four EAP alternates in Findlay are the 42 highest scoring finalists in the USHJA’s Horsemanship Quiz Challenge, now in its second year. While all EAP applicants must take and pass the Level 1 Quiz with a minimum score of 80 percent, the Quiz finalists had to earn 90 percent to qualify for the Level 2 Quiz and then be among the top three in each zone or the top 10 nationally to qualify. On arrival today they sat for another written exam to determine which teams and individuals will qualify for a practicum in which hands-on skills will be evaluated. Quiz finalists will take part in seminars all weekend and observe the EAP National Training Session; the top three teams and individuals will be recognized in Sunday’s award ceremonies. Check out the Chronicle’s coverage of the 2012 EAP Finals. Get more information about the Emerging Athletes Program.